April usually brings the first "warm" weather of the year. Shorts might even be appropriate cycling attire. A ride on Camano Island is the perfect way to enjoy an April day. The bright yellow blooms of the Tall Oregon Grape, Mahonia aquifolium (pictured) and Dull Oregon Grape, Mahonia nervosa are prominent. 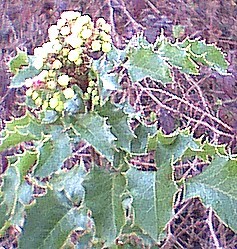 Oregon Grape is easily identified by it's holly like leaves. To distinguish between the two native species takes closer examination. 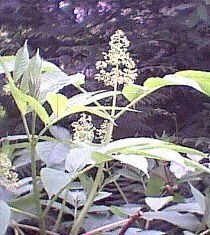 M. aquifolium generally has shiny leaves, is taller and has a single mid vein. M. nervosa is generally lower growing, has dull leaf coloration and three parallel veins. The sour berries are eaten by humans and animals. Mixed with Salal berries an excellent jam can be made. Though not a "grape" at all, wine is made from the berries. The bark and roots were used to make yellow dye and medicinally as a tea. Red Elderberry, Sambucus (sam-bew-cus: the greek term) racemosa arborescens (ras-em-oh-sa: bearing racemes; arbor-es-enz: treelike) are fast growing under-story shrubs that quickly invade cleared areas. The showy April blooms will last into May here on Camano Island. The berries are a favorite of birds which in turn distribute the seeds.